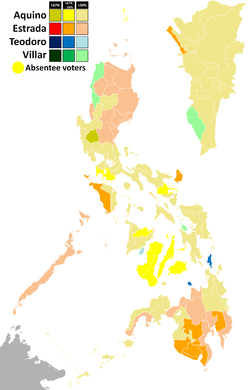 Elections for all positions in the Philippines above the barangay (except for Autonomous Region in Muslim Mindanao regional level) were held on May 10, 2010. The elected president is Benigno "Noynoy" Aquino, the 15th President of the Philippines, succeeding President Gloria Macapagal-Arroyo who was barred from seeking re-election due to term restrictions. The successor of vice-president Noli de Castro is Jejomar Binay, the 15th vice president of the Philippines. The legislators elected in the 2010 elections have joined the senators of the 2007 elections and comprise the 15th Congress of the Philippines. The 2010 election was administered by the Commission on Elections (COMELEC) in compliance with the Republic Act No. 9369, also known as the Amended Computerization Act of 2007. It was the first national computerized election in the history of the Philippines. Although there were cases of precinct count optical scan (PCOS) machine failures, there was no postponement of elections since most technical issues were resolved by election day. Despite the fact that some provinces have reported failure of elections, these have not surpassed the 0.50% of the total number of PCOS machines, and most were replaced on time. Local elections were held in all provinces, cities and municipalities for provincial governors, vice governors and board members, and city/municipal mayors, vice mayors and councilors. There were more than 85,000 candidates for 17,000 national and local positions and it is believed that the youth had the swing vote in this election as 40% of voters are 18-35 and there are a potential 3 million first-time voters. The current Philippine constitution allows a president to serve for only one six-year term; however, former president Gloria Macapagal Arroyo served for a total of nine years because she took over the last three years of Joseph Estrada's administration when Estrada was ousted as the result of the 2001 EDSA Revolution. In 2004, Arroyo won the election and finished her 6-year term in 2010. Number of registered voters as compared to the national total per province (left), and voter turnout per province (right). In a decision dated December 2, 2009, the Supreme Court ruled that appointive officials seeking positions in the elections do not need to resign from their posts, striking down Section 4(a) of COMELEC Resolution 8678, Section 13 of Republic Act 9369, and Section 66 of the Omnibus Election Code as unconstitutional, "for violating the equal protection clause and being too broad." As election day approached, several politicians switched political parties in order to gain votes and funding for the campaign. Many switches were controversial, with the ruling party Lakas Kampi CMD having the most defections, most of which went either to the Liberal Party or to the Nacionalista Party. Furthermore, Luis "Chavit" Singson resigned from Lakas and endorsed a candidate aside from Gilberto Teodoro, but did not join another party. Singson endorsed Villar, then resigned from Lakas, but has not joined Villar's Nacionalista Party. Five days before the elections, petitions were made to postpone the elections due to technical malfunctions with the electronic voting machines. On May 7, 2010, the Supreme Court rejected the petitions, affirming the vote would go ahead as planned. Several cities and provinces encountered several problems, postponing the election. In Caloocan, voting was delayed as the box of ballots delivered to clustered precinct 599 in the city's Pajo district contained ballots for a clustered precinct in Sampaloc, Manila. Election hotspots in the Philippines. Prior to the end of the filing of certificates of candidacy, the COMELEC had anticipated several areas to be named as "election hotspots". On November 23, 2009, the entourage of the wife of Buluan, Maguindanao vice-mayor Esmael Mangudadatu who ran for provincial governor, including journalists, were abducted and killed in the province's town of Ampatuan. Before she was killed, Mangudadatu's wife blamed provincial governor Andal Ampatuan Jr. as the culprit. Ampatuan Jr. was later arrested. After several arms and military vehicles were seized in Ampatuans' properties and government installations, President Arroyo declared martial law in parts of the province not controlled by the Moro Islamic Liberation Front on December 4. On December 28, 2009, a candidate for councilor died, and two incumbent officials were wounded in an ambush in Dingras, Ilocos Norte. The gunmen fired at the convoy including barangay chairwoman Joen Caniete, who was running for councilor under the Nacionalista Party; the wounded included a sitting councilor and a provincial board member. In Sorsogon, Julio Esquivias, a Nacionalista candidate for councilor in the town of Casiguran, died due to a gunshot wound after he was shot by an unidentified gunman. In a command conference by the Armed Forces of the Philippines, Philippine National Police and the COMELEC, 14 election "hotspots" were identified. They were Abra, Ilocos Norte, Masbate and Nueva Ecija in Luzon, Samar (Western Samar), Eastern Samar and Antique in the Visayas, and Basilan, Sulu, Maguindanao, Lanao del Norte, Lanao del Sur, Sarangani, and Zamboanga Sibugay in Mindanao. Worsening private armed violence was a serious security concern which had the capacity to undermine the 2010 elections. Even though a commission was already formed to dismantle private armies, skeptics were unconvinced that the government could have succeeded in this task as it had a poor track record of dealing with the ongoing problem of internal violence. Before election day, a bomb exploded at 1:20 a.m. in Ampatuan, Maguindanao. No casualties were reported. In Conception, Iloilo, armed men fired at the Liberal Party headquarters. No casualties were reported. During election day, three bombs exploded at a polling precinct at Pakpak elementary school in Marawi City, Lanao del Sur. No casualties or injuries were reported. Another bomb exploded in Zamboanga Sibugay, killing three people. Two bombs exploded at Mindanao State University where several polling precinct were clustered. An NK2 grenade exploded at Shariff Aguak, Maguindanao. No casualties reported. On the same day, at 12:00nn (PST), a shooting incident happened in the same area between the rival candidates. Two innocent persons were killed. As of 1:30pm (PST) fourteen casualties were reported due to election-related violence. at 2:25pm (PST), a shooting incident in a barangay in Maguindanao caused the local cancellation of the elections. Many concerned civil society groups including the Center for People Empowerment in Governance (CenPEG), Philippine Computer Society (PCS), and Global Filipino Nation (GFN) protested the illegality and unconstitutionality of how the elections were conducted, particularly with implementing safety measures against fraud and cheating. The number of disenfranchised voters is sufficient to greatly affect the results of the elections. The Automated Election System (AES) was implemented without the appropriate field testing, and law-specified testing in actual elections. The source code review was not completed and initial findings were not addressed. No audit was done on the AES prior to the elections. There was only a mandated random manual audit which was not yet done at the time the report was written (May 27, 2010). Several voter and security features were disabled prior to elections. While Republic Act 9369 states that "The election returns transmitted electronically and digitally signed shall be considered as official election results and shall be used as the basis for the canvassing of votes and the proclamation of a candidate. ", the Commission on Elections (COMELEC) issued Resolution 8786 on March 4, 2010 which became the basis for the decision to remove digital signatures which the COMELEC ruled as no longer necessary. Three Board of Election Inspectors (BEIs) were originally required to put in their iButton Key for the results to be digitally signed before transmission and make it official. But because of the issuance of COMELEC Resolution 8786, BEIs were directed to press "No" when asked by the PCOS machines to digitally sign the files for transmission. "On March 4, 2010, Comelec issued Resolution 8786 dated March 4, 2010, essentially disabling the use of digital signatures. Thus, the electronically transmitted votes from the precincts no longer bear digital signatures. Several excuses were given by Comelec ranging from PCOS machine signatures being equivalent to digital signature (which of course is not true); use of digital signature will require another P1 billion (as if digital feature is not included in the P7.1-billion contract); reducing transmission time (how less than one minute signing digitally will reduce much a transmission of about 30 to 60 minutes? ); and the PCOS i-button and BEI Personal Identification Numbers (PINs) are equivalents (of course, not)". Reports indicated that the election day was marred with controversies, particularly in the insurgent-ridden province of Mindanao, though other provinces also faced difficulties such as computer glitches on the voting machines, disorderly conduct, vote buying, and violence. In Cebu City, spikes placed by unidentified men on the road caused a delay in the delivery of ballot boxes throughout the province of Cebu early Monday. A total of over 76,340 precinct count optical scanner (PCOS) machines, about 5,000 back-up units, and about 1,700 servers were deployed in the country's first nationwide fully automated elections—from counting of votes to transmission and canvassing of election results. Election day had live full coverage from GMA 7 and ABS-CBN. Besides logistical problems, during the last few days prior to the election poll machine and services supplier Smartmatic-Total Information Management (TIM) found cases of PCOS machine failures. Nonetheless, it was decided not to postpone elections since the technical issues were resolved quickly and the solution could be deployed by the day of election. Despite the fact that some provinces reported issues in the election process, these did not surpass the 0.50% of the total number of PCOS machines, and most were replaced on time, as planned for. As a result of the delays, the COMELEC extended voting hours from 6:00 p.m. to 7:00 p.m. and continued through the night transmitting the votes from every precinct scattered across the country. The presidential candidate with the greatest number of votes, Benigno Aquino III was declared the winner. A separate election was held for the vice president; the two elected officials need not be running mates in order to be elected. ^ Binay is Joseph Estrada's (PMP) guest candidate for vice president. ^ Legarda is Manny Villar's (Nacionalista) guest candidate for vice president. Parties that had the plurality of votes in each province. One-half of the Philippine Senate was up for election. The Philippines uses the plurality-at-large voting system for the Senate race. ^a Votes and seats for KAMPI and Lakas-CMD in 2007, which were running on a common ticket, were combined; KAMPI and Lakas-CMD later merged in 2008. ^b Including Imelda Papin and Zosimo Paredes who switched from KBL and Ang Kapatiran respectively to Bangon Pilipinas. House of Representative elections results for representatives elected via congressional districts. Result of the party-list election: inner ring is the proportion of votes, outer ring is the proportion of seats won. The large gray slice on the inner ring represents all parties that did not win a seat. All seats in the House were up for election, elections were done for legislative districts and party-list. ^ Of all 286 House members, including party-list representatives. ^ Includes United Opposition members. ^ Includes Jose de Venecia Jr., who currently has no party. ^ a b Includes votes for Sandugo party, whose only nominee withdrew, but his name stayed on the ballot. Numbers for invalid votes in the Bulacan–1st, both Camarines Norte districts and both Lanao del Sur districts are not available. ^ Excludes overseas absentee voters (568,732) who are ineligible to vote for district representatives. *there are more nominees listed in case one of the first three nominees are either disqualified or are removed from office. In some instances, the parties submitted two lists; in those the cases, the second list submitted is listed. The United States and the European Union praised the republic for the smooth elections. The US embassy was one of the first to hail the general elections. We look forward to a smooth transition and, after June 30, to working with the new Philippine government to deepen the friendship and partnership between our two nations, and to advance our common goals for the benefit of the Southeast Asia region and the world. Seeing the patience and the number of people turned in the elections, EU ambassador Alistair MacDonald shared his experience and reflection in observing the Filipinos. I had the privilege of observing the electoral process in both Cavite and Batangas and was impressed by the manner in which this first nationwide automated election was conducted. Despite the intense heat, the long lines and the inevitable unfamiliarity of a new process, our observations suggested that this process was carried out smoothly, and the results transmitted rapidly, in the great majority of cases. He also appreciated the teacher's hard work for the said elections. ^ "Republic Act No. 9369" (PDF). Congress of the Philippines. Archived (PDF) from the original on 2010-05-06. Retrieved 2010-05-10. ^ "Over 400 defective poll machines found, replaced, Smartmatic says". gmanews.tv. Archived from the original on 2010-05-12. ^ "Continuity or Change?". the-diplomat.com. Archived from the original on 2010-03-15. Retrieved 2010-03-12. ^ "After backing Villar, Zubiri quits Lakas-Kampi". ABS-CBNNews.com. 2010-03-24. Archived from the original on 2010-04-30. Retrieved 2010-04-16. ^ "Guv bolts Lakas, supports Villar". GMANews.tv. 2010-04-11. Archived from the original on 2010-04-15. Retrieved 2010-04-16. ^ "Rep. Gonzales leaves Lakas to join LP". Manila Times. 2010-04-13. Archived from the original on 2012-06-09. Retrieved 2010-04-22. ^ Dedace, Sophia (2010-04-14). "Arroyo adviser Joey Salceda deserts Lakas in favor of LP". GMANews.tv. Archived from the original on 2010-04-17. Retrieved 2010-04-16. ^ "Lakas exodus continues: Two Mindanao execs jump to NP". GMANews.tv. 2010-04-15. Archived from the original on 2010-04-17. Retrieved 2010-04-16. ^ "(Metro News) QC mayoralty bet Annie Susano joins Estrada's camp". Balita.ph. 2010-04-20. Retrieved 2010-05-02. ^ Supnad, Mario (2010-04-14). "Chavit, Ilocos leaders leave Lakas for Villar". Manila Bulletin. Archived from the original on February 24, 2012. Retrieved 2010-04-16. ^ Pazzibugan, Dona (2010-05-08). "SC: It's all systems go; Court junks petitions to postpone polls". Philippine Daily Inquirer. Archived from the original on 2010-05-10. Retrieved 2010-05-08. ^ "Glitches cause delays in first automated polls nationwide". gmanews.tv. Archived from the original on 2010-05-11. ^ "21 killed in Maguindanao". INQUIRER.net. 2009-11-24. Archived from the original on 2009-11-26. Retrieved 2009-11-27. ^ "Massacre planned, says Buluan vice mayor". INQUIRER.net. 2009-11-26. Archived from the original on 2009-11-27. Retrieved 2009-11-27. ^ Kwok, Abigail (2009-11-26). "Ampatuan surrenders, to be flown to Manila". INQUIRER.net. Archived from the original on 2009-11-29. Retrieved 2009-11-26. ^ "Martial law declared in Magundanao". Archived from the original on 2015-01-06. ^ Lazaro, Freddie (2009-12-28). "Poll bet killed, six hurt in Ilocos Norte ambush". The Manila Bulletin. Archived from the original on 2010-01-02. Retrieved 2010-01-08. ^ Calleja, Danny (2010-01-06). "NP local candidate gunned down". Business Mirror. Archived from the original on January 13, 2010. Retrieved 2010-01-15. ^ Alvarez, Katharina (2010-01-09). "14 provinces named as election hotspots". SunStar Manila. Archived from the original on 2011-06-09. Retrieved 2010-01-15. ^ "Issues Snapshots: Security and Radicalism". the-diplomat.com. Archived from the original on 2010-03-15. Retrieved 2010-03-12. ^ "Armed men fire at Liberal Party headquarters in Concepcion, Iloilo". GMA News Online. Archived from the original on 2018-05-10. ^ "R.A. 9369 - AN ACT AMENDING REPUBLIC ACT NO. 8436, ENTITLED AN ACT AUTHORIZING THE COMMISSION ON ELECTIONS TO USE AN AUTOMATED ELECTION SYSTEM IN THE MAY 11, 1998 NATIONAL OR LOCAL ELECTIONS AND IN SUBSEQUENT NATIONAL AND LOCAL ELECTORAL EXERCISES, TO ENCOURAGE TRANSPARENCY, CREDIBILITY, FAIRNESS AND ACCURACY OF ELECTIONS, AMENDING FOR THE PURPOSE BATAS PAMPANSA BLG. 881, AS AMEMDED, REPUBLIC ACT NO. 7166 AND OTHER RELATED ELECTIONS LAWS, PROVIDING FUNDS THEREFOR AND FOR OTHER PURPOSES". www.chanrobles.com. Archived from the original on May 11, 2010. ^ "2010 Elections: In Maguindanao and Elsewhere: Chaos, Violence, Fraud - Bulatlat". bulatlat.com. 10 May 2010. Archived from the original on 13 May 2010. ^ "Election Results (Philippines) - Eleksyon2016 - GMA News Online". gmanews.tv. ^ "Inquirer.Net: Fast count stuns nation". inquirer.net. Archived from the original on 2010-05-14. Retrieved 2010-05-12. ^ 2 senatorial bets bolt parties, join Bro. Eddie Accessed on March 8, 2010. ^ a b c "US, EU praise RP for milestone elections". Archived from the original on 2013-01-31. Retrieved 2010-05-12.